At Kids Reference Company, we specialize in the distribution of the most current and compelling children's literature to libraries and schools throughout the country. Our expanding group of dedicated professionals know first hand the importance of helping children grow through reading. Here at KRC, we offer a unique type of purchasing experience for our customers. 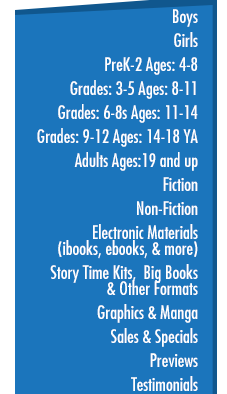 Our user-friendly website showcases a wide range of fiction and non-fiction in a variety of formats for PreK through YA. This combined with our consultative approach, makes our company one-of-a-kind in the industry. We’re proud of the relationships we have developed with our customers. Let us know if there is a title or series you need for your collection - we are here for you. We would like to thank you for your continued support and collaborative efforts. It is always our pleasure to work with you.